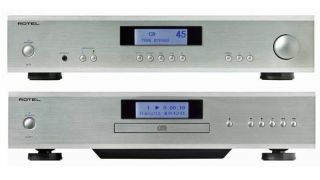 Rotel introduces budget A11 stereo amp and CD11 player | What Hi-Fi? At ISE (Integrated Systems Europe) this week, Rotel is debuting its A11 integrated amplifier and CD11 CD Player. The two new models mark the latest expansion of the brand’s established 14 Series, which includes the A14 and A12 amplifiers and CD14 CD spinner. Utilising 30 years of Rotel’s CD player-making experience, the CD11 is as versatile as you’d expect from a CD player of today, with both RCA and coaxial connections, the latter fed by a 24-bit/192kHz DAC. The A11, meanwhile, expands on its four RCA inputs and moving-magnet phono stage with an aptX/AAC Bluetooth receiver. As with many of its Rotel siblings, it also utilise a custom, oversized toroidal transformer delivering 50 watts per channel of Class AB amplification. Both include 12V trigger connections and a bidirectional RS232 control interface for integration with a wide range of control systems, and feature front-panel displays and an IR remote. The A11 and CD11 are available in silver or black finishes, priced £599/$699 and £429/$499 respectively.